All of our water tanks are UK manufactured in our factory with high quality MPDE plastic, which makes it suitable for domestic and commercial uses. Our water tanks can be used to collect rainwter from house or factory roof. Pre Moulded into the water tank is a 1" BSP outlet which can be used attach a brass tap or hose connector. The impact resistant plastic makes it perfect for factories, garages and warehouses. The only added extra made to the tank is an 8" vented lid. 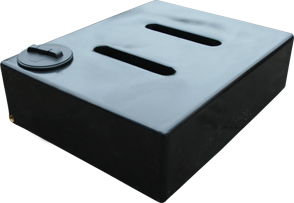 There is an 8" vented lid on the top of the tank to give you easy access to the inside of the tank. Its baffle inside of the water tank, makes this water tank perfect for transporting water in the back of vehicles for window cleaning and car valeting..